Difficult to understand, Yoda’s past is. 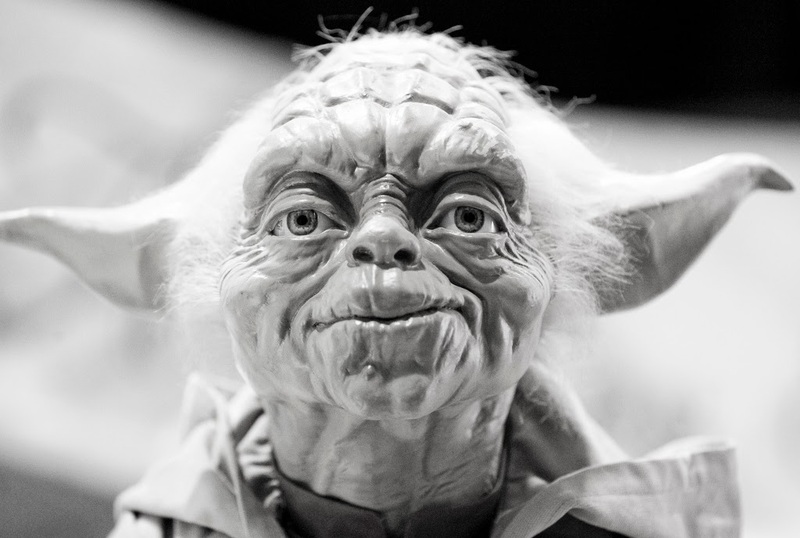 Yoda, as you likely know, is the creation of George Lucas and a very important character within the Star Wars movies. An interesting question, however, arises when you look at what has actually been published about Yoda, and what you’re allowed to create about him. You’d assume with someone so intricate to the story there would be a detailed history of who he was. However, you’d be wrong. In truth, despite being one of the most iconic aliens within the Star Wars timeline, as well as being a fan-favorite, very little is known about Yoda. He was smaller than a meter in height, lived to be 900-years-old and could lift an X-wing out of a swamp with nothing but the power of his mind (“size matters not,” remember? ), but many questions like “Where did Yoda come from?” or “How many Yoda-like creatures are there?” just can’t be answered by the movies. Fans have been asking these tough questions for a long time. George Lucas, however, has been ignoring them. When talking about what species Yoda actually is, George Lucas candidly joked that Yoda is “the illegitimate child of Kermit the Frog and Miss Piggy.” This is a reference to the voice-actor and puppeteer of Yoda (Frank Oz) who also worked with the Kermit the Frog and Miss Piggy muppets (click here to watch the documentary where George makes the joke). 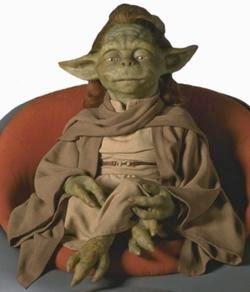 Furthermore, George has, on multiple occasions, referred to Yoda as a “frog.” While the reason for George’s mystery attitude toward Yoda is unclear, what is clear is that George doesn’t want anyone to do anything that might reveal more about who Yoda is, where he came from or what the rest of his species is like. Yoda is George’s creation and no one is allowed to touch it. Seriously though, George’s obsession with keeping him secret borders on insanity! Here is what the almost-entirely-destroyed card looked like. But wait; there’s more! Renowned science fiction author Robert J. Sawyer was requested by his publisher to write a trilogy of novels that delve deep into the history of the Star Wars universe. The first of the series, set to be called Alien Exodus, would detail the liberation of various alien slaves from their massive insectoid alien overseers. Despite his ingenious first line “An even longer time ago, in a galaxy far, far away...” Sawyer eventually withdrew from the project. His reasons for leaving? It was decided that the books couldn’t use any of the races or species that appeared in the Original Trilogy. The books were re-assigned to a different author, all new alien species were created and a similar line of stories were published under the Lucasfilm brand as the Alien Chronicles (but without any implied association to the Star Wars universe). Now, ask yourself this, what species of aliens do you suspect Sawyer wasn’t allowed to use? Rumor has it, that the books may have included Yoda’s species. For those curious, you can read more about Sawyer’s proposed book here. Now, don’t get me wrong. There have been plenty of books published about Yoda, and there have even been other Yoda-like characters to appear within the Star Wars Universe. 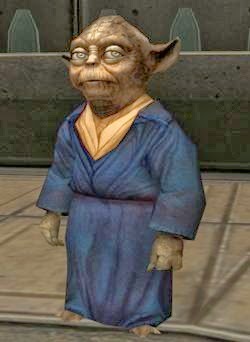 In Episode I there was a female of Yoda’s species called “Yaddle,” and in the Old Republic Era there was another Jedi master by the name of “Vandar Tokare.” Don’t worry though, both of these characters are as mysterious and unrevealing as Yoda. Though at least Vandar has a last name. That’s sort of exciting, right? In the end, however, despite several misleading rumors, next to nothing is known of Yoda’s Species. As it stands now the only way to touch on Yoda’s backstory is via the oft-criticized genre of “fan fiction," (though in my limited research I found more Yoda Erotica than anything) (and no I will not give you the link). Now that George has relinquished control of the Star Wars franchise to Disney, it will be very interesting to see what, if anything, is revealed about Yoda. There are rumors of a stand alone film being created with Yoda at the center, but it’s unclear if this would entail Yoda’s past, or just a more detailed account of what we already know about him. What do you think? Do you think Yoda’s back-story needs to be developed? Or do you agree with George that it should always be a mystery? Let me know in the comments below. Clasan, Cenev. "What is Yoda's species and where is he from?." Yoda's Datapad. (2002): n. page. Web. 17 Mar. 2014. Corvi, Steven J. "A Galaxy Not So Far Away: Writers And Artists On Twenty-Five Years Of Star Wars." Journal Of Popular Culture 38.5 (2005): 961-963. International Bibliography of Theatre & Dance with Full Text. Web. 17 Mar. 2014. Dan, Juan. "The Origins of Yoda." Watch Mojo. n.d. n. page. Print. <http://www.watchmojo.com/video/id/11655/>. Gaultier, Alexander. "Abandoned Universe: What Could Have Been." Eleven-ThirtyEight. (2013): n. page. Web. 17 Mar. 2014. Higson, Chris. "The Definitive History of Jedi Master Yoda. "Sabotage Times. (2013): n. page. Print. Lopez, Gus. 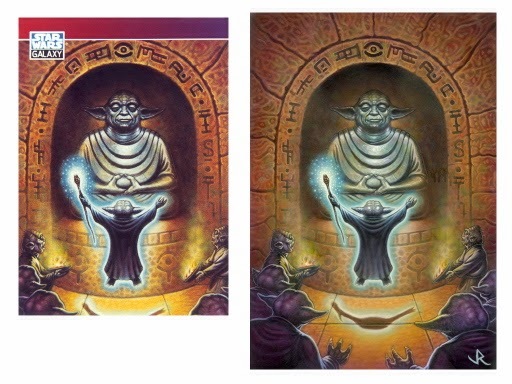 "Unproduced Topps Galaxy Yoda(s) Card. "Archive Database n.pag. The Star Wars Collectors Archive. Web. 17 Mar 2014. <http://theswca.com/index.php?action=disp_item&item_id=48887>. Lucas, George, prod. Star Wars: From Puppets to Pixels: Digital Characters in Episode II. YouTube, 2002. DVD. 17 Mar 2014. <https://www.youtube.com/watch?v=rh-5UhwcBW0>. Meyer, David S. "Star Wars, Star Wars, And American Political Culture." Journal Of Popular Culture 26.2 (1992): 99-115. International Bibliography of Theatre & Dance with Full Text. Web. 17 Mar. 2014. Sawyer, Rob. Alien Exodus. Pre. Ave Books, 2003. Web. <http://www.sfwriter.com/alien.htm>. I'd like to know more about Yoda's race and don't see how it would lessen his character. After all we learned about Chewbaccas planet in books for a long time before GL revealed it. If anything it will enhance his story but the issue is I feel like GL made Yoda to not be a real character but more so an ideology, so by that thought he probably just never created a back story for him and never bothered to.